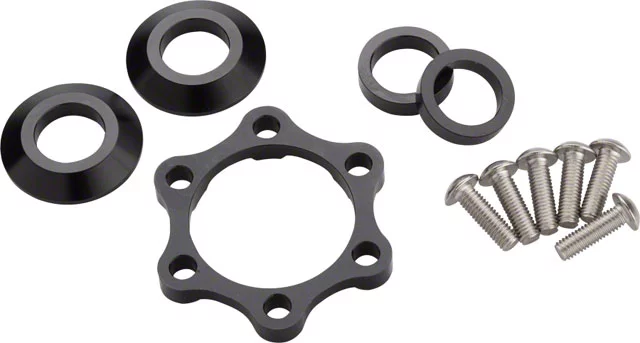 Is it possible or recommended to use spacers to fill the gap left by using 100mm front and 142mm rear hubs on boost frames and forks? Is it fair to think to add possible 2 x 3mm spacers rear ? 5 + 5 mm spacers front? How to adjust the rotor / caliper positioning? To be clear, a wheel adapted this way offers none of the advantages of Boost, since the flange spacing remains the same. While these kits are being sold without any such compunction, it's worth pointing out that they put extra leverage on the hub rotor mounting holes and on the axle. Personally I wouldn't be surprised if there's a scenario where you could get a hub or axle to fail because of this - if you look at some hubs, Hope is what I'm thinking of, you can see there's a very minimal amount of material around the rotor mount. So I'm dubious how universal of a solution these kits really are in that sense. Not the answer you're looking for? Browse other questions tagged mountain-bike wheels rotor boost-spacing or ask your own question. Terry front wheel (ISO 520 vs 540), big difference? Will two spacers between the cassette and the hub effect the chain line?